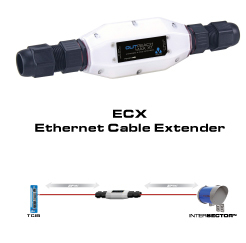 The ECX Ethernet Cable Extender lets you locate your INTERSECTOR Motion and Presence sensor right where you want it, without being restricted by the 300 foot limit for Ethernet cables. The ECX allows cable runs for the INTERSECTOR of up to 600 feet, doubling the allowable distance. It’s rugged and streamlined enclosure features IP66-rated connector covers that assemble easily around conventionally terminated Cat 5e and Cat 6 cables.